"Thomas Jefferson: The Art of Power" gives readers Jefferson the politician and president, a great and complex human being forever engaged in the wars of his era. Philosophers think; politicians maneuver. Jefferson's genius was that he was both and could do both, often simultaneously, catapulting him into becoming the most successful political leader of the early republic, and perhaps in all of American history. Meacham has chosen storytelling over analysis, offering up a genial but meandering narrative. There is some meat in the book, but finding it requires dexterity and doggedness—checking the endnotes after every ten pages or so to see what is missing from the passing panorama. Meacham has read the scholarly literature on Jefferson—some of it critical—but doesn’t let enough of this debate intrude on the storytelling, which nearly always puts Jefferson in the best possible light. Mr. Meacham intends “The Art of Power” as a portrait that “neither lionizes nor indicts Jefferson, but instead restores him to his full and rich role as an American statesman who resists easy categorization.” That sounds bolder than it proves to be. It’s a polite way of staking out middle ground. The last few decades have not been kind to the reputation of Thomas Jefferson. Recent biographies of John Adams and Alexander Hamilton have extolled their subjects' virtues at Jefferson’s expense. Further, strong evidence that he probably fathered children with Sally Hemings has lent weight to public perceptions of the man's hypocrisy. 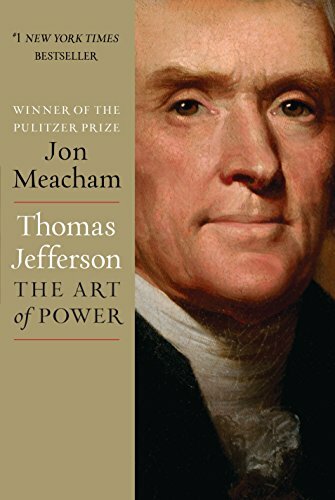 Jon Meachem’s Thomas Jefferson: The Art of Power offers a balanced view, one that acknowledges his subject's flaws while recognizing his greatness as a founding father and U.S. president. Meachem’s biography is a substantive work of nearly 500 pages (not including 200 pages of notes and bibliography). While I cannot judge its accuracy, it is an extraordinarily detailed and well- documented account of Jefferson’s life, replete with endnotes for the serious reader. The image of Jefferson that emerges is that of a human being in all his complexity – a flawed giant if you will, who dreamed large and accomplished great things, as one of the founders of a nation. As a modern reader not steeped on politics of the era, I was intrigued to learn of the bitter political quarrels that divided the early nation, and the vitriol that characterized political debate. I was also interested to learn just how effective Jefferson was as a politician, despite strong opposition, weak resources, and the precarious situation the colonies and resultant nation faced. One need only remember that Jefferson doubled the size of the newly formed United States, and expanded its outlook to the Pacific, to acknowledge his stamp on the country's history. Thomas Jefferson: The Art of Power managed to be an interesting read, and almost exhaustingly informative, without being an enjoyable one. I have read other biographies, other books about historic events or periods in history that were fare more enjoyable and reader friendly than this dry story of an intriguing man. In this book we are reminded that Thomas Jefferson was almost obsessive in pursuing an education in the classics, the arts and languages, as well as in leadership. He was an inventor of many things from apparently a dumbwaiter to a plow and even the round sundial and a bookstand. Some of these inventions are referred to within the pages of this dreary read. In short, it seems to me that he would be quite the handy man to have around as he was a problem solver and designer, as well as something of an engineer and efficiency expert. Not a bad list of qualities in your every day working man, never mind politician and political hero. One thing that touched me, being a reader was this. On February 1, 1770, when his Shadwell house burned, his grief was primarily for his library, which was lost in the fire. Jefferson was passionate when it came to serving his country and caring for his family, which at one point included not just his own wife Martha Wayles Skelton Jefferson, who was known famiiarly as Patty, and small daughter, but the wife and children of his brother. His sense of responsibility extended to the households of extended family members, and to this was added the house slaves left behind when his wife's father died in may of 1773.These slaves included Hemings family. The Hemings,Elizabeth, her sons Robert, James and john and his wife's half sister Sally Hemmings, were to serve him well and in many and various capacities over the years. Some in fact were regarded as members of his family, at least in his own heart. Did jefferson strike a deal to win the presidency? Was a vote for Jefferson, merely a vote against Adams under whom he had at one time served as Vice President? He ran with Aaron Burr as his intended Vice President in his first term. The election was a bitter one.It seems as if political shenanigans have changed little since the early years of american politics. History tells us that Jefferson served two terms, I have to wonder if he did so reluctantly? Among the things Jefferson is known for besides drafting the Declaration of Independence, is his purchase of the area known as The Louisiana Purchase, abolishing foreign slave trade and he was the first to claim Executive privilege He retired from office in 1808, after serving not only as President of the United States for two terms. He was a man well loved by his family for whom he seemed ready to jump any hurdle or take on any and all responsibility. He was cherished and respected by his grandchildren. After finally reaching the end of this tome, much of which is devoted to notes, which I confess to have mostly skimmed, I find that I respect Jefferson much more as simply a man, than as a politician or President. Not that his political career was a failure or in any way one undeserving of respect. It is more that his life as a family man was so stellar as to, for me, eclipse his public life and contributions. This integrity of spirit is what lent a positive light to his time serving his country while in office as Second Governor of Virginia, Ambassador to France, a position which he clearly enjoyed, then the First US Secretary of State to this newly minted country . He was also Second Vice President of the US, which led finally to his serving as Third President of the US. I knew of Jefferson from my reading of his sponsorship of the Lewis and Clark expedition, who are personal heroes of mine, and of his incredible feat of dealing in the Louisiana Purchase – surely one of the most fantastic bargains in the whole history of real-estate? I also saw exhibits in Philadelphia (and subsequently read of) his drafting and re-writing of the Declaration of Independence and visited his elegant plantation Monticello in Virginia, and of his wonderful library that led to creation of the University of Virginia. But of the man – other than that gleaned from his letters to Lewis and Clarke – I knew little. Jon Meacham’s wonderful “life” has filled in the shadows and illuminated his greatness both as a politician, leader and public figure and has exposed some of his personal failings as a man. How a ‘democratic’ leader, so committed to Liberty he risked his life to gain it for his country could maintain slaves is a deep, mysterious, fault. The relatively recent, DNA supported findings that several of these slaves were his own children – by another of his slaves, Sally Hemmings – is astonishing. ”This moral and political depravity” he called slavery but only at his death were his own slaves either released or sold off. His relationship with Adams, a friendship that grew out of an original animosity, was sealed at his death by Adams dying on exactly the same day, (600 miles away) with his final words being the assertion “Jefferson survives”. Perhaps he does in the democratic mores of America, the concern of the Whigs was always ‘the people and government’ and that of the Tories was ever the Monarchy, class and wealth. Perhaps the best answer as to why Jefferson remains a hero to many, is his intelligence and in a wonderful tribute another hero to many Americans, President J F Kennedy, at a function for recipients of the Nobel prize said of this predecessor …”I think this is the most extraordinary collection of talent, of human knowledge, that has ever been gathered together at the White House, with the possible exception of when Thomas Jefferson dined alone.”! Thomas Jefferson: The Art of Power is another well researched, well written Presidential biography by Jon Meacham. Jefferson's life and accomplishments are extensively covered. While no new ground is covered, Jefferson's life is retold in a readable and engrossing way. The one quibble I had with the book was the fact that the author might have been too impressed with his subject. While Jefferson's failings were discussed, they felt a bit glossed over to me. Jefferson's ardent support of the French Revolution, despite having witnessed the brutality of the mobs first hand, stayed with him long after other supporters of that cause abandoned it in horror. The attempted seduction of his close friends wife was nothing short of sleazy. The nasty campaign Jefferson personally waged for the Presidency was barely mentioned. And of course, his relationship with Sally Hemmings, while discussed, was not really delved into. The same man who wrote the Declaration of Independence, who in his youth argued for the freedom of slaves and throughout his life longed for its eventual abolition, kept four of his own children as slaves along with their mother. True, he kept his word and freed them upon hi s death, but the rest of Monticello's slaves were sold to pay for the debts he incurred while living a lavish lifestyle far beyond his means. Something a man of Jefferson's intelligence had to know would happen. The author is correct that it is a mistake to judge historical figures who lived and died hundreds of years ago by modern standards. But even by the standards of his own day, some of Jefferson's personal actions and his domestic situation was considered vile and the height of hypocrisy. A sense of Jefferson's character has always eluded me. Meacham, early on in The Art of Power, nails my image of the man: “When we think of Jefferson in Philadelphia in the summer of 1776, we think of a philosopher at work with a quill pen and an agile mind shaped by, and suffused with, Enlightenment ideas about the rights of man.” Meacham argues, with impressive evidence, that first Jefferson was a politician, expert and getting and wielding power, and that he was a philosopher, too – like he was a farmer, too – and so I finally feel like I have a handle on the man. The book covers Jefferson's entire life – birth to death, enriching the text through numerous quotations both from Jefferson's voluminous correspondence and the correspondence of others. We find he was an extremely sociable man, was fond of women, loved conversation, and abhorred conflict so much that he tried to apply power indirectly as much as possible, and much preferred writing and casual conversation to any sort of political debate. Meacham neither exaggerates no seeks to avoid the Sally Hemmings “controversy” but simply states the case, that Jefferson had a long-term sexual liaison with a slave, and the children of that liaison were born into slavery. Since neither Jefferson not Hemmings left behind any documentation of their relationship and since the affair was apparently undertaken in secrecy, we just don't know how they felt about each other or what was the nature of their relationship. Meacham, wisely, doesn't speculate. It feels odd to write this, but I think the book would have benefited from being longer. Though I'm pretty well read in the Revolutionary period, I had to set the book down to look up some references to vaguely mentioned events, and as well as Meacham writes, a few lines, or even a few pages, of more thorough explication wouldn't have burdened the reader and would have eased our understanding of Jefferson in the context of events in which he was not directly involved – and so which remain undocumented as events in his life. This is an excellent book, fascinating and insightful. However, it's also not your average biography. Most biographies tend to be of the type "Such-and-such and His Times", with lots of background of people and events that aren't necessarily directly related to the protagonist, but help to round out the understanding of the time and place. In Meacham's book, there is much less of this "and His Times". The Declaration of Independence is dealt with in a few pages. The voting in the House of Representatives to resolve the electoral college tie of the 1800 election is covered in a single sentence. Many events which are major milestones in other biographies (think McCullough's "John Adams") are mentioned briefly and in passing. This biography is tightly focused on Jefferson's character, often as related by himself in his letters to others and vice versa. And that's the other feature that might put off some folks. There are many quotes from letters and other documents of the period and the style of the writing may be difficult for smooth reading. Jon Meacham did a bang-up job on Andrew Jackson with American Lion. Now in Thomas Jefferson: The Art of Power, he tackles the more difficult, deeper subject of our third President. There's no way any one book could do justice to Jefferson, so naturally Meacham focuses on a particular aspect of Jefferson: here he gives a picture of Jefferson's use of power - political, social, racial, economic - to get what he wanted. Fortunately, what he wanted worked out really well for us! Jefferson was both an idealistic theorist and a practical politician in his use of power. Meacham's case that much of his life can be understood in the interplay between these two poles is a good one. It is, by nature, a simplification of Jefferson the man, but does help us understand why the man who wrote "We believe these truths to be self-evident: that all men are created equal..." could also keep his own children and mistress as slaves until his death. Or why the man who fought so strongly against a Federalist government could add so much to the power of the Presidency by completing the Louisiana Purchase, essentially without authorization from Congress. I've read quite a few biographies of Thomas Jefferson, and I suspect I'll probably read quite a few more over the course of my life. But I'm not sure that it's possible to write a better one-volume biography of Jefferson than Jon Meacham has in Thomas Jefferson: The Art of Power (Random House, 2012). Clearly and elegantly written, extremely closely documented (with my usual gripe that I wish the notes were indicated in the text, since they are very good indeed), and drawing on up-to-date scholarship and expertise, this is a book that will stand the test of time. Of course it's not possible to cover every aspect of such a varied and full life completely: for Jefferson's reading life, Kevin Hayes' The Road to Monticello remains the more thorough treatment. Annette Gordon-Reed's The Hemingses of Monticello goes into greater depth about Jefferson's relationships with the enslaved people who surrounded him. I would have liked more on Jefferson's scientific and literary pursuits, and on his agricultural and gardening interests. But as a biographical treatment, Meacham has done the reading public a great service with this book, and I'm sure it will receive the wide recognition it deserves. Thomas Jefferson was a fascinating and complex man, and this biography is a fascinating and complex book. If your history classes were like mine, during early years of the formation of this country, the establishment of the United States was a forgone conclusion. Not so, and not only did I learn about the man, I learned more about the struggles of my country's creation. This isn't a light and easy read, but it is also not unduly scholarly. For my tastes, I prefer the writing style of David McCullough, and his John Adam's biography is one of my all-time favorites. Still, I very much enjoyed this book, and for anyone interested in the early U.S., recommend it along with McCullough's John Adams and Walter Isaccson's Benjamin Franklin: An American Life. Jon Meacham has once again produced superb biography on one of America's founding fathers. I learned of Meacham's skill as a writer and historian from his book, American Lion: Andrew Jackson in the White House. Jon Meacham's most recent book, Thomas Jefferson: The Art of Power is a comprehensive and illuminating biography of one our greatest founding fathers. When thinking about this review I decided to try an answer the question – Why should you read this book? The book is not a casual read. The book contains 500 pages of the details of Jefferson's life from his childhood to his death in 1826. There have been many biographies of Jefferson, good and bad. Why make the effort with this book and Thomas Jefferson? Thomas Jefferson is perhaps the most complex of all the founding fathers. Benjamin Franklin comes nearest to to Jefferson as a scholar and diplomat but without the opportunity as president. Jefferson; the philosopher, scientist, farmer, governor, diplomat and president makes for nearly timeless insights into governing in a democracy. Meacham skillfully dissects volumes of material to describe how Jefferson became the leader we know. He also shows the multiple sides of Jefferson. For example, his life long philosophical opposition to slavery but a slave owner. A republican and believer in limited central government but the first president to exercise war powers and expansion of presidential power. The story of the Louisiana Purchase shows a pragmatic president acting for the good of the nation despite concerns of constitutionality. This book is a valuable reference source for Jefferson insights that are entirely relevant today as 200 years ago. For example, in 1811 Jefferson wrote to his son-in-law John Wayles Eppes describing the infighting in Congress. This sentiment might equally apply today! "United by no fixed principles or objects and destitute of evrything like American feeling, so detestable a minority never existed in any country --- Their whole political creed is contained in a single word 'opposition'---They pursue it without regard to principle, to personal reputation or best interests of their country." Another marvelous effort from Mr. Meacham. Clear, concise, lucid, flowing text. Not the usual adjectives that are used to describe the narrative a work of biography. But that is what Meacham's latest work Thomas Jefferson: The Art of Power is. This is a thorough biography that is not too big to tackle by any readers standards. The difficulty that Meacham overcomes, to make a life of Jefferson accessible and understandable to all readers, is to me the greatest achievement this book attains. Meacham covers the span of Jefferson's life in detail, but not too much detail as to lose the flow of the narrative and not get bogged down in the minutia. The prose Meacham employs engages the reader gives him a familiarity, it allows the reader a chance to at intimacy, and gives life to a man who has been in the grave for more than one hundred and eighty years. As always, the author utilizes great resources. It is a rare historic biography that is at once both academic as well as recreational. Not a hagiographic biography. Meacham does not hide any of the family ugly issues and contradictions. It is comprehensive but not overwhelming. Jon Meacham has written an incredibly readable, enjoyable biography of Thomas Jefferson. how to make history from 200 years interesting has been done by jon Meacham. The dialog and story line kept me interested into the long nights of reading. I would definitely recommend to anyone wanting to learn more of history. This Thomas was quite the guy. I found this to be a very readable biography. The period and players are all very interesting, but everything took longer than we seem to remember and it was all messier and more political. I think this makes reading books on the time more painful, like a slog through deep weeds. This biography seems to avoid that by treading so lightly on some things. It's all there, but not in great detail. If you want to understand more about a specific period or event, there are other resources to look to. I think this was necessary to get through the entire life of such a prolific and complex man during such a momentous time in history. For the main, I believe Meacham kept a balanced view of Jefferson, showing his weaknesses and failures as well as his strengths and accomplishments. However, the light touch mentioned above also means none of these are dwelt upon long enough to really absorb the issues. And at times I was not entirely sure how much Jefferson had contributed directly to yet another event or document. With this biography, Meacham appears to continue to float in that narrative sphere between popular journalist-historians (Alter,Woolfe) and popular academic-historians (Ellis, Kearns Goodwin, Morris). His writing most closely resembles (in many, many ways) Walter Isaacson and David McCullough. They write similar types of biographies and seem to inhabit a similar clumped intellectual range. There have been few times when I turned the last page of a book and sighed with relief, but this was one of them, although I listened to the audio so it was the final word I heard that gave me such pause. My husband had been reading the print book and found it very slow, so we decided to listen to the audio version together. Although the reader was good, there was little he could do with such a drily written tome. It was well researched and there were abundant facts, too many at times, and that made the book tedious when it could have been alive if it was less bogged down with what felt like little known, unnecessary details that seemed included only to fill pages and pages as if there were a predetermined amount the author wished to write. At times it was so boring it was more like a sleeping pill! It was repetitive, and included too many incidental pieces of information like the coupling of his coming across a suicide victim (with a graphic description), with the purchase of a sheepdog. The relevance escaped me. Every famous personage of Jefferson’s time, that he knew or that knew of him, was mentioned in the book. Oftentimes the facts did not concern Jefferson, but them, instead. There was gossip, but not of the captivating kind. It was a potpourri of white noise, in some cases, just facts that could have been left out without altering the book’s value. I did not feel that Jefferson, the man, was developed that fully, but rather the facts about the people around him were stressed. So, if I had to rate the book, I would give it 4 stars for research, 3 stars for the reader and 2 stars for the book itself, which simply failed to ignite my interest. Whole sections of the book slipped by without me being aware of the message as the reader devolved into a monotone because there was no way to inspire the narrative with any expression. Often the book went off on a tangent and explored issues that distracted me. Jefferson was one of the Founding Fathers, he helped draft the Constitution, authored the Bill of Rights, signed the Declaration of Independence, was Secretary of state, vice president, and finally, a two term President of the United States. The man was definitely a lover of politics, a believer in state’s rights and the voice of the people. His image should have jumped off the pages with passion. A brilliant man of many talents, he was interested in horticulture, music, farming, hunting, science, libraries, and politics. He loved America and wanted to see it thrive. He wanted to see the people happy and less divisive and he worked toward that goal his entire career, however, he was arrogant and was not easily persuaded to change his mind once set on a course of action. He was a womanizer as a young man but when he finally married, at age 28, he was devoted to his wife and never married again after her death, honoring her wish that her children never have a step parent who cares nothing for them. Bereft, he takes his oldest child, Patsy, and travels to France where he becomes enamored with the country. Although he never married again, he was not celibate. He carried on a long term affair with Sally Hemmings, which began when she was just a young teenage slave of mixed race, who bore several of his children. Jefferson did not believe that slavery was moral, but nevertheless, he kept up the practice.